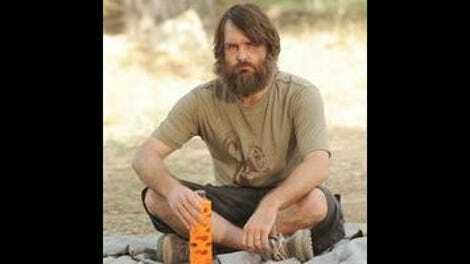 From its beginning, The Last Man On Earth has argued that a community is as necessary for survival as food, water, or shelter. The series may have started as a story about one man’s struggle with loneliness, but it very quickly became one about the difficulties of living with other people, especially after an apocalyptic event all but eliminated the necessary skills for such a task. Though its first season filtered this conflict solely through Phil, its second season has expanded it to the rest of the Malibu crew with each week featuring more infighting about personal beliefs and character flaws. Carol so desperately wanted her and Phil to return to the group because she wanted to live with a makeshift family, but as the both of them learn, all families are dysfunctional, even if they’re the only family left on the planet. “No Bull” is the best episode of the season so far because most of the bubbling conflicts within the group finally come to a head. 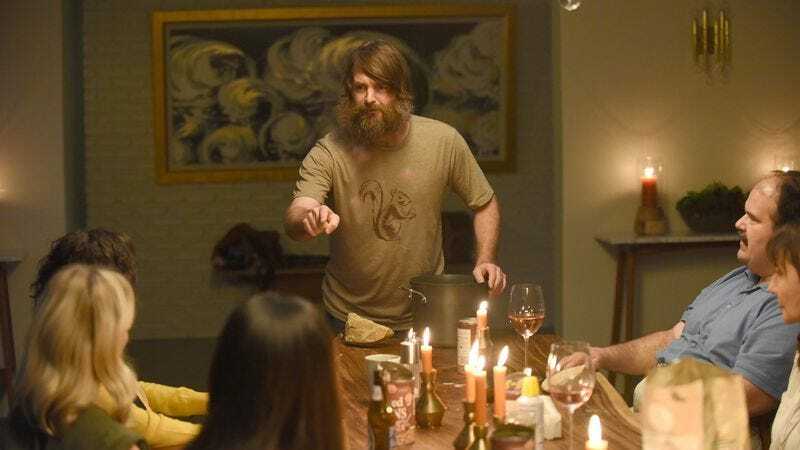 It not only tackles the group’s disgust with Phil 2.0, but also Todd and Melissa’s failing relationship, Gail’s grief after Gordon’s death, and even Carol’s problems with fertility. It repositions Phil as the benevolent leader of the group because of his insistence that they all stick together and not fall prey to their own worst impulses. Phil may be prone to some misguided ideas, but he’s also the one person who knows what it’s like to ruin a chance at a new life because of selfishness and miscommunication. In fact, he may be the only person in the group to fully understand the value of a community because he has been cast out of one so many times. And all the while, his brother floats above the Earth without any human contact, hoping and praying that anyone will hear his desperate calls. However, Phil doesn’t want to believe that. He tries to redirect the group’s search efforts towards Phil 2.0 instead of the bull, but none of them are interested because of their own personal problems. Todd catches Gail fooling around with the CPR dummy dressed up like Gordon, but when Gail explains she just misses her late husband and the importance of holding onto relationships, he tries to bridge the divide between him and Melissa only for her to break it off completely. Meanwhile, Carol worries that it’s taking a long time for her to conceive which manifests as not-so-subtle jealousy towards Erica. The group has been splintering for weeks now, but it only takes the presence of a newborn and the absence of a practical force for them to start turning on each other. When Phil tries to illustrate how none of them are without sin by placing actual stones in front of them, things finally blow up in the best scene of the season. Everyone starts sniping at each other for their various offenses—Carol’s moral superiority, Todd’s insistence on avoiding conflict, Gail’s drinking problem, etc. It’s a damning look at how uneasy group dynamics can lead to an eruption even at the slightest provocation, as well as how various competing agendas can naturally drive people apart. It was easy when Phil was the group’s common enemy, but now that they all have gotten to know each other’s personal failings, everyone becomes the enemy. It’s a scene that reminded of the best episodes of Community, a series built upon the idea conflict inherently exists amongst even the tightest of groups. But the Malibu crew aren’t even friends, they’re just people thrown together because of a terrible catastrophe. It’s no wonder that Phil could only break it up by literally throwing a stone through a glass window. “No Bull” isn’t explicitly a “Thanksgiving” episode, but it embodies the themes of one so well that it doesn’t even have to utter the word. When the group sees the bull finally arrive at their feet, they all instinctively shoot it with tranquilizer darts at the same time, unintentionally killing it in the process. It’s a nice, understated moment which illustrates their bond even when they couldn’t be emotionally farther apart. They even let Phil 2.0 back into the group after he not only comes back with the bull but pledges to return to the stocks for his delayed punishment. Though none of their conflicts are completely resolved or any of their problems fixed, they still sit together and enjoy their big dinner as one family. It may not be a perfect day, but they keep hanging on to each other regardless. What more can you ask for during this time of the year? Thanks so much to Jesse Hassenger for filling in for me last week. He did a great a job per usual. Jason Sudeikis returns at Phil’s brother Mike in yet another heartbreaking subplot as he tries to make contact with Earth. It’s devastating to watch him realize the signal he thinks is coming from Earth is really a recording of himself, not to mention the final shot of him huffing nitrous alone. His recurring guest spots are slowly becoming one of my favorite parts of the series and I wish they were more frequent. Mike’s ideas for reaching contact with Earth: A telescope and bouncing a laser pointer off of the Taj Mahal. “Terry’s” idea: Turning the lights on and off until someone notices. Though Lou Reed’s “Perfect Day” did much of the heavy lifting, I’d be lying if I said those last few minutes of the episode didn’t move me. Todd and Gail briefly kiss after Todd and Melissa’s breakup, an event which I’m sure will come up again in the weeks to come. Will Forte puts in excellent work this episode, especially his convoluted “team” speech which was so wonderfully nonsensical. Also, Kristen Schaal disappointingly looking at pregnancy tests lit only by headlights was another beautiful moment.